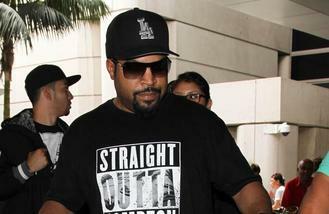 The 'Straight Outta Compton' star would be up for having the 'All Day' rapper running the United States as he thinks " who's better than Kanye" to be in charge and he even wouldn't mind having his wife, Kim Kardashian West as the First Lady because it doesn't matter who is President, you've still "got to work in the morning". Asked who he would vote for, Ice told the Daily Mail newspaper: "I'm voting for Kanye. Why not? Who's better than Kanye to run?" And on the 'Keeping Up with the Kardashians' star being the wife of the president he added: "It's cool. If that's what it is, that's what it is. No matter who is the President, you gotta all get up and go to work in the morning." During his Michael Jackson Video Vanguard prize speech at the MTV Video Music Awards on Sunday (30.08.15), Kanye joked that he wanted to run to be leader of America in 2020. Another star who is keen for the 'Four Five Seconds' hit-maker is Rihanna who recently said if people vote multimillionaire Donald Trump then "who wouldn't vote for Kanye" because his "speech was incredible". The 'Diamonds' singer previously shared: "I mean people are voting for [Donald] Trump. Who wouldn't vote for Kanye? I got to see his speech and I'm really, really elated with it. His speech was incredible."